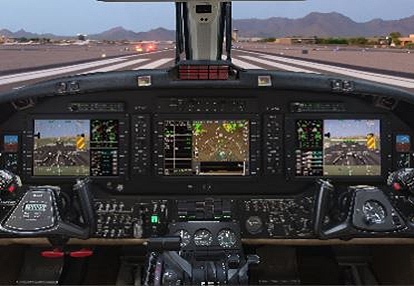 BendixKing, a division of Honeywell (NYSE: HON), has received certification for the AeroVue integrated flight deck for King Air B200 aircraft. The new flight deck is available now, and brings business jet technology and functionality to the general aviation cockpit. This is BendixKing’s first supplemental type certificate for an integrated flight deck and the first in a planned series of aircraft models. BendixKing’s AeroVue includes three high-resolution 12-inch liquid crystal displays with Honeywell’s SmartView™ Synthetic Vision System software. The software enhances pilot safety and alertness, especially when flying and landing at night, in bad weather, or at unfamiliar airports. AeroVue includes a track-based flight management system and heads-up display symbols on the primary display that make it easy to “point and fly” exactly where the pilot would like to go. The flight deck also has a cursor control device mounted on the center console that eliminates the need for pilots to reach out to the instrument panel, which can be inaccurate and laborious during turbulence or high workload phases of flight. AeroVue is also compatible with the Aspen Avionics Connected Panel™ Wireless Gateway, allowing updates for navigational aids to happen wirelessly. These new cockpit technologies bring owners and operators to the digital age with a state-of-the-art integrated flight deck that features a sleek, visually-appealing design and commercial durability. The AeroVue system weighs 125 pounds less than currently-installed equipment, resulting in reduced fuel consumption, greater range and more payload capacity. Finally, AeroVue brings owners into compliance with the Federal Aviation Administration’s ADS-B mandate.